The conventional way to define ’emerging occupations’ is to use the official list of ‘new and emerging’ occupations put out by O*NET, a government-funded source of occupational information. Unfortunately, that list is mostly composed of many older and unexciting occupations, such as allergists and immunologists, investment fund managers, radiologists, securities and commodities traders, and surgical assistants. These and many other occupations on the list have been around for many years, and really don’t deserve the term ‘new and emerging’. Conversely, the O*NET list does not include many obvious emerging occupations such as social media and digital marketing. 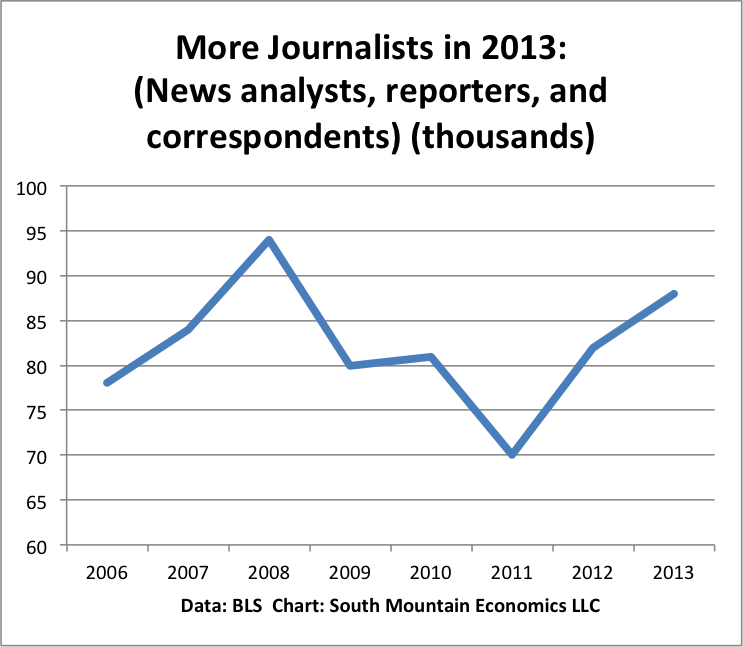 Notably missing, in addition, is anything to do with mobile, wireless, smartphones, or app developers. So we do not use the O*NET list. Instead, our definition is that an emerging occupation is new enough that it has not yet developed clear career paths or clear job titles. In other words, it’s hard to tell from a job title whether you are appropriate for the job. Moreover, in an emerging occupation, you can expect to have to help define your job yourself, even after you have started. Take “information security specialist,” an ever-more important job in today’s world of nasty data thefts and perpetual attacks on corporate IT systems. Just to look at the title, you have no idea whether you would be better off with a coding background, or a criminal justice background. After all, given that many data break-ins are based on social engineering, the latter might be more important than the former, depending on the job. Information security specialist is a classic example of an emerging occupation, where the nature of the job is in so much flux that it has outrun the job title. In a future post, I’ll describe how one searches for a job in an emerging occupation. The demand for digital marketing jobs continues to grow. 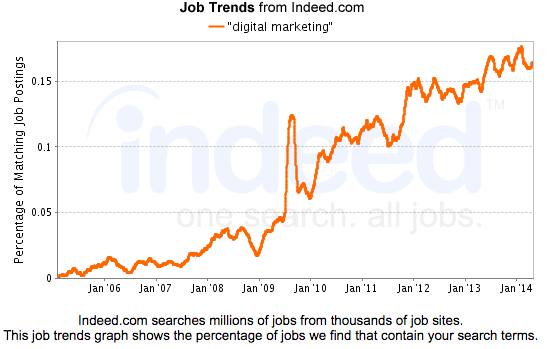 Based on data from Indeed.com, and we see that ads that contain the term “digital marketing” are a rapidly rising percentage of all want ads (below). That accurately reflects the shift in the labor market towards jobs that have a direct or indirect connection with the data-driven economy. Every major company which has a consumer-facing or business-facing marketing presence–which is pretty much every company–needs digital marketing experts. It’s worth noting that in a city like New York, want ads that contain the phrase ‘digital marketing’ amount to 1.2% of all ads, close to the 1.5% looking for accountants. 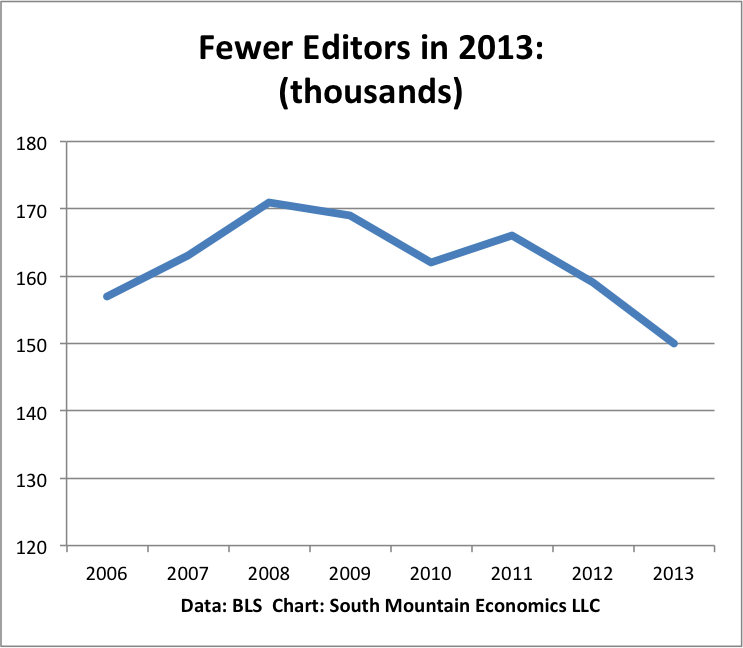 This chart probably under-represents the demand for digital marketers, since the field is so new that job titles have not yet been standardized. the tech/info sector in the combined London-East-Southeast region is growing faster than California, even taking into account the rapid growth of San Francisco. Below is a chart that shows the difference. 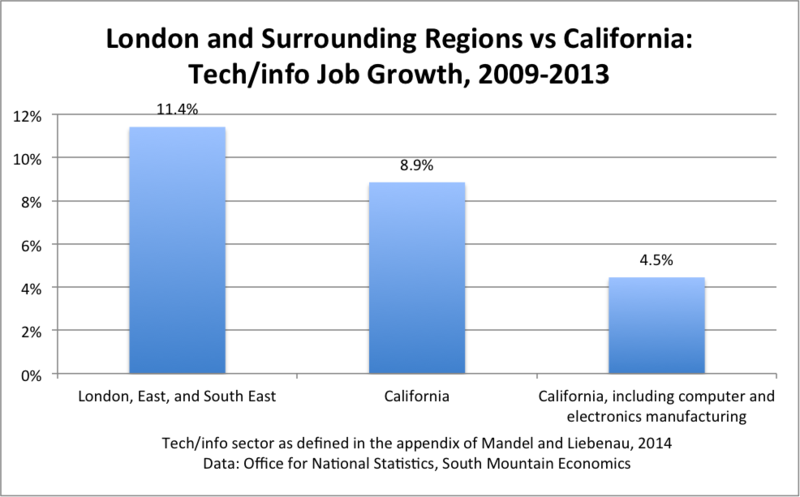 Between 2009 and 2013, tech/info employment rose by 11.4% in the combined London-East-South East regions of the UK, compared to an 8.8% rise in California. If we add in the computer and electronic products manufacturing industry into California’s total, that reduces the state’s growth rate even further. There are two factors explaining this result. First, the tech/info sectors in the East and South East regions are actually growing quite smartly. At the same time, the tech/info sector in the Los Angeles metro region has been lagging globally, showing only a 2.9% growth from 2009 to 2013.